Q Corporation invented the smooth edge cutter, so we have more experience in the use and service requirements than anyone. We have more machines in place than all of our competitors combined. Standard tool room grinding of our cutter rings can cause microfracturing of the carbide cobalt interface, which shortens service life. 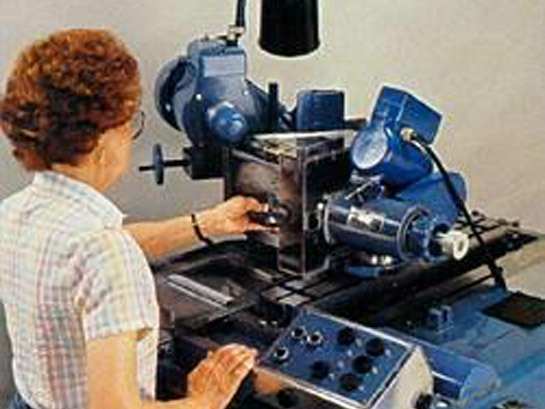 Q Corporation’s computer-controlled resharpening process removes precise minimum material amounts, without cobalt/carbide microfracturing. This results in longer cutter ring life and low cost for reconditioning. With Q Corporation’s resharpening process, rings are typically shipped in and out of our facility within 48 hours. Our trimming specialists offer the most qualified advice on trimming questions, and you can call them at no charge. Our computerized service provides precision consistent results. Full time trimming experts are on call, as close as your phone. Our clients always receive their own cutters, no mix ups. Only Q Corporation manufactures genuine Q-Cutters. Our goal has always been to provide our customers with the most economical equipment solutions. Our product line includes, Lead-Trimming Systems, Manual Surface Mount Taping Systems, and Automated Surface Mount Taping Systems.